Crossing the finish line is a feeling like no other. Barriers have been breached. You have attempted the impossible, and you did it! You can feel the power of accomplishment and you are looking into the future with a whole new attitude. You know you can do the undoable now, because you just did it! What else can you do that you previously thought impossible? Your future has no bounds. Whatever it is you’re dreaming of doing next, pursue it and get moving. Over the coming months and year I’ll be standing by to hear of your new endeavors and of your accomplishments. I’m here to tell you, there has never been a single Pacer who finished their first marathon that didn’t have a major breakthrough in life. Tighten your seatbelt and get ready because you’re in for quite a ride! Let’s all get out there on the road of life and stretch our reach for greatness. 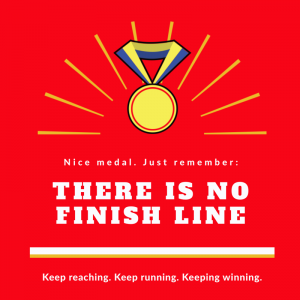 Now I have some bad news for you: when it comes to achievement and where your health is concerned, there is no finish line. There’ll be plenty of time to rest when you’re dead! I’m so sorry to tell you this but there ain’t no finish line, folks; not with running and not with achievement. If there’s going to be effort involved, you might as well endeavor to do something worthy of your true potential. Go ahead, show humankind that you are truly capable! So what are you going to do now that you have run the LA Marathon? Set a goal, get moving. The next big Pacer race is Mountains-to-Beach, then the Philippe’s run. You ran to glory with the Pacers, surrounded by people who have come to really admire you. And you need them. Stay with the Pacers and keep on keeping on.